Show up at an elegant cocktail party, schmancy reception or formal event and the majority of women there will probably be wearing Chanel No. 5, Shalimar or one of any number of other similar scents. Want to really stand out? Forgot the eau de toilette and pour on some eau de thunderstorm. Crack open a bottle of black pepper. Dabble on some mulled cider. Color yourself with the scent of Crayon. Or mesquite. Or vanilla cake batter. Those unusual perfumes are among the 250+ fragrances developed by Demeter. 2) How much, despite #1, you can make a wearable perfume from such unperfume-y aromas. 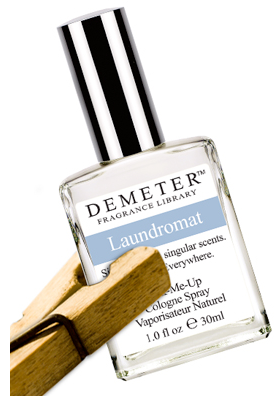 Even Demeter’s most unusual fragrances — glue, dirt, turpentine, rye bread and window cleaner, among others — don’t smell as if they are weird for weird’s sake. That’s because, behind the company’s creative scents there’s a serious perfumery. 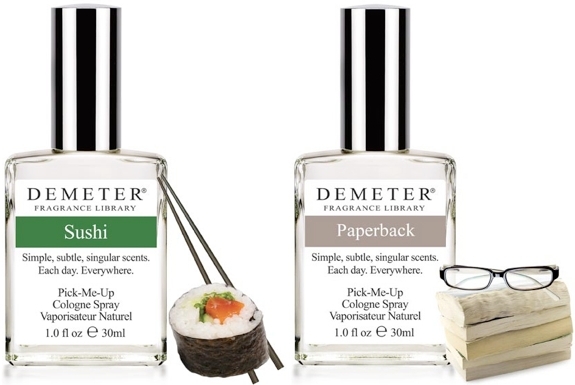 Demeter’s mission is to create fragrances that reflect their own perspective completely independent on what the other players in the global US$33 billion perfume industry are doing; it’s the sort of out-of-the-box company Spot Cool Stuff just loves. What’s also loveable: Demeter manages to create their perfumes without using any binders, emulsifiers or Phthalates. In fact, at least 95% of the ingredients in every fragrance are derived from natural or renewable resources! Even more impressively, Demeter’s fragrances are very affordably priced. The majority of Demeter scents are designed for women, though there are a handful that work for men too. The downside is that Demeter perfumes tend to have little staying power compared to a typical high-end fragrance. That’s a bummer if there’s a scent you love and want it to last all day long. But it isn’t necessarily a bad thing if you are looking to experiment. So you can go ahead and try fireplace without the risk of walking around for the next 12 hours smelling like you just came back from a camping trip. Another problem: There are so many interesting Demeter scents to choose from. In making a selection you might tell yourself “I’ll select the frozen pond now but get the gingerbread scent next time.” The thing is, gingerbread might not be available next time. Among the Demeter fragrances that are no longer produced: new money, mushroom and lobster. Condensed Milk — Really smells like condensed milk, sweet but not sickeningly sweet. The scent is nothing for every day but great for layering and if you want something comforting. Sushi — Spicy and citrusy, like ginger and lemon, with an oceanic base. There’s great freshness in this perfume, but the fragrance doesn’t last very long. Waffle Cone — A sweet yummy, foody kind of scent. Smells like breakfast. Laundromat — A wonderful scent for men as well as women. Smells much more like freshly washed clothes than an actual laundromat. If you are familiar with Omo detergent, it has that sort of non-floral, dark soapy scent. Earthworm — Incredibly earthy. Think potting soil that’s been sitting out in the sun. Baby Powder — A true baby powder scent without being “babyish” — just clean, fresh, delicate and feminine. Fuzzy Navel — A refreshing, fun fragrance. It smells like peaches and oranges. Also, it seems to linger a little longer than my other Demeter fragrances. Pink Lemonade — A crisp blend of pink lemonade, sweet and tart and refreshing on a balmy summer day. You can almost hear the chink chink of the ice cubes in the glass, it’s that authentic. But after one hour the scent was barely sticking around. Funeral Home — In this scent, you can smell the floral arrangements surrounding the dearly departed. You can smell wax and formaldehyde, tears and musty carpet. It’s kind of amazing actually. But it’s not what anyone living should smell like. Paperback — Maybe smells a bit like book glue (combined with vanilla and cinnamon) but not really like books. Orange Pop — Sweet, tangy and woody. It’s less like an orange popsicle and more like the wooden stick of an orange popsicle. Mojito — Starts out just like a mojito with sweet mint, citrus and alcohol. Fades to a green-scented talcum powder. Thuderstorm — A crazy- weird scent, it really does smell like urban asphalt during a rainstorm! Wet Garden — Goes on as a true hyacinth fragrance, complete with dirt and stems and grass. A lovely fragrance. Gingerale — Perhaps Spot Cool Stuff’s favorite Demeter scent (though there are many we haven’t tried). It’s light, effervescent and cheerful without overpowering with ginger. Kahala Blue Hawaiian — Pure canned pineapple! The favorite scent of many a Demeter fan. These fragrances are pretty funny. Do people actually buy them and go out smelling like that though? I would think these are purchased as mainly gag gifts. I just can’t see people wanting to smell weird when they’re out in public.